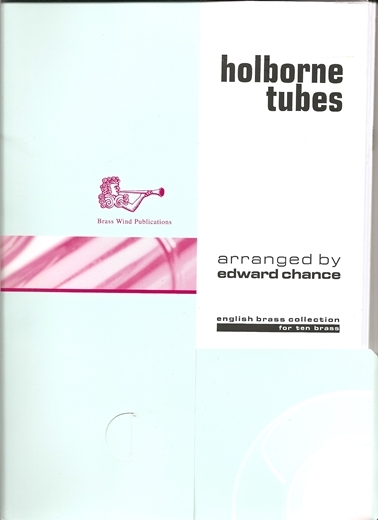 In 2006 Paul Archibald asked me to write a piece based on the dances of the popular Elizabethan composer Anthony Holborne c1545-1602 to be performed and recorded by the International Celebrity Trumpet Ensemble. Because the instruments in the line-up (trumpets, trombones, organ, bass drum and side drum) were all made of tubes of one sort or another, the title quickly suggested itself. Continuing the implied reference to Holborn Tube Station, The Faery Rounde thus became Round Trip and The Face of Melancholie inspired Rush Hour Pavane. The Choise became Red or Blue?, which are the colours of Holborn's lines, the Central and Piccadilly on the tube map and I inserted a middle section based on the unnamed Galliard no 40 to represent the second line. The ten piece version was first performed under Paul's direction at the Aberystwyth Musicfest. The original recording is available on a double CD entitled Proclamation on the Brass Classics label (BC3005).